Ajanta Ellora Caves are situated in Aurangabad district of Maharastra, India. Ajanta Caves and Ellora Caves have been declared as UNESCO World Heritage Sites. If you are looking for a heritage tour package, Ajanta & Ellora Caves is the answer for that. The paintings at Ajanta and Ellora caves are of unfathomable heritage value. In spite of its old age dating back to 2nd century BC, the paintings inside the caves looks fresh. The sculptures are also excellent in its artistic value. Ajanta caves were cut into the side of a cliff that is situated on the south side of a U shaped gorge on the small river Waghora or Wagura. There are a number of water falls on the gorge, sound of which can be heard inside the caves, when the river is high. Ajantha caves were previously forest areas. Once the caves were not used, it was covered by think forests. They were rediscovered by a British officer, John Smith, in early eighteenth century, while going on a hunting. 30 Buddhist cave monuments which dates back to the second B.C. century are seen in Ajantha caves. Ajantha caves include painting and sculptures which are believed to be of the best surviving examples of Indian art, especially masterpiece of Buddhist religious art. Around 100 Kilometers away from Ajantha caves, you can find the ‘Ellora Caves’. Ellora Caves are the epitome of Indian rock-cut architecture. Majority of them (17 out of total of 34 Ellora caves) are Hindu religious art unlike Ajantha caves which are Buddhist religious art. You can find many Buddhist, Hindu and Jain temples at both these caves. 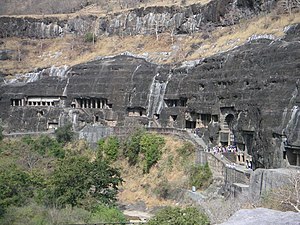 Cave numbers 1 to 12 in Ellora are Buddhist caves (12 in total), cave numbers 13 to 29 are Hindu caves (17 in total) and cave numbers 30 to 34 are Jain caves (5 caves in total). These shows the religious harmony prevalent in that time. Cave 16 has the beautiful Kailasha temple or Kailasanatha temple. Kailasanatha temple is dedicated to LOrd Shiva and is considered as one of the most remarkable cave temple in India for its architecture, size and sculptural value. How Do I Go to Ajanta Ellora Caves? Ajanta Caves are situated at about 60 kilometers from ‘Jalgaon’ railway station on the Mumbai – New Delhi railway line and is at a distance of 104 kilometers from the historic city of Aurangabad. Ellora Caves are at a distance of 29 kilometers North-West of the city of Aurangabad.